← Short and Sweet Reads: What Are These Novella Things In Jane Austen Fan Fiction? 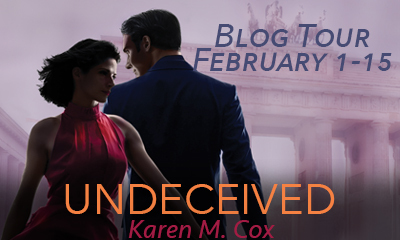 I’m very glad to receive Karen M. Cox on From Pemberley to Milton today with a very interesting guest post as part of her blog tour for Undeceived . Here, you will read nothing less than an interview with our dear Mr. Darcy, and also be able to participate in the giveaway Meryton Press is organizing. Thank you, Rita, for your gracious invitation to guest post on From Pemberley to Milton! Today, I’ve got something special planned: an interview with the hero of my hot-off-the-presses release, Undeceived, published by Meryton Press. Mr. Darcy fascinates us still, so I know he’ll give us some fantastic insight into the mind of a legendary icon of English literature. Let’s start, shall we? During the last gasp of the Cold War, Elizabeth Bennet, a young, forthright counterintelligence officer, embarks on an exciting assignment that would make her late father, a fallen CIA officer, proud. She transfers to Europe to investigate the legendary and elusive William Darcy, an officer in line for the coveted Soviet station chief position who’s suspected of being a double agent. Elizabeth wants to throw the book at him, but the facts don’t match her preconceptions. Is Darcy being set up? Are there darker forces at work? Or is William Darcy a skilled double agent after all? Nothing is as it seems, however, and the closer Elizabeth gets to the truth about Darcy, the more she spirals into danger. Undeceived, the new novel by award-winning author, Karen M. Cox, is part romance, part spy game suspense—inviting readers to uncover the villain in this variation on Pride and Prejudice, Jane Austen’s classic tale. Karen M Cox writes novels accented with romance and history. All three of her published novels: 1932, Find Wonder in All Things, and At the Edge of the Sea, have garnered awards from the independent publishing industry, taking top honors three out of the five times they were recognized. Last year, she also participated in Meryton Press’s inaugural anthology, Sun-Kissed: Effusions of Summer, with her short story, “Northanger Revisited 2015.” Her fourth full-length novel, Undeceived: Pride and Prejudice in the Spy Game, will be released in early 2016. Karen was born in Everett WA, which was the result of coming into the world as the daughter of a United States Air Force Officer. She had a slightly nomadic childhood, with stints in North Dakota, Tennessee and New York State before moving to her family’s home state of Kentucky when she was almost twelve. She lives in a small, quiet Kentucky town with her husband and children, and works as a pediatric speech pathologist. She spends her off hours reading, writing, and being a wife and mom—and spoiling her new granddaughter. Well that managed to be a fascinating interview even though Officer Darcy was pretty close mouthed about most things! I’d love to know more about the Spy Rules. 114? The mind boggles. This was hysterical!! Well done ladies. Who knew he’d be so tight-lipped during an interview he consented to? Makes me wonder what he’s hiding?? It’s amazing how many interesting and new premises we find in JAFF isn’t it Denise? Super cute interview. Darcy in the 1980s. Love the interview. Most intriguing. I look forward to reading this book as I really enjoyed 1932. I am amazed at the number of variations and time lines that Darcy and Elizabeth fit into so well. Thanks for the chance of a giveaway and for sharing Darcy’s innermost thoughts???? Me too Glynis! The possibilities for P&P variations are endless! No wonder we keep reading them and wanting more and more. Fun interview, not that much was divulged. It was fun for what he ~didn’t~ say. Do you suppose he had a stick up his a- …. um, you know, like when he first insulted Lizzy at the lecture? Thank you so much for coming to From Pemberley to Milton and for bringing such a fantastic character interview Karen!